A former island daily features editor who spent 25 years with the newspaper has died aged 69. Tributes have been paid to Elaine Hanning, pictured left, who worked at the Jersey Evening Post from 1982 to 2007. Elaine joined the JEP as women’s page editor and later worked in the newsroom, as a sub-editor and features editor. Her historical knowledge led her to produce the JEP’s Liberation 50 supplement in 1995, marking 50 years since the island was freed from German occupation at the end of the Second World War. Around 7pc of Jersey’s population were born in Portugal or Madeira, and Elaine was also responsible for introducing the paper’s weekly ‘Bem Vindos’ pages aimed at Portuguese and Madeiran readers with the aim of involving those communities in island life and to give them news from back home. She herself had moved to the island as a child, after her family were forced to flee the Persian Gulf in the 1950s. Elaine’s late husband Peter was Constable of Jersey’s St Saviour parish from 2008 to 2011, and she worked “tirelessly” for the area after her retirement. 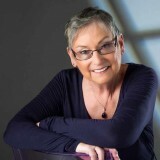 Former JEP editor Chris Bright told HTFP: “Elaine Hanning was one of those strong, talented, colourful characters who make working in newspapers such a memorable experience. “Elaine combined a sharp intellect with great natural empathy and insight, making her an excellent feature writer and features editor. “She was a straight talker who held robust opinions and enjoyed an argument, but always did so with a sympathetic nature and a kind heart.